These are my notes on how to read the PWM servo signal coming from the Traxxas TQ receiver. Disclaimer: use this information at your own risk. I am not responsible for any damage. 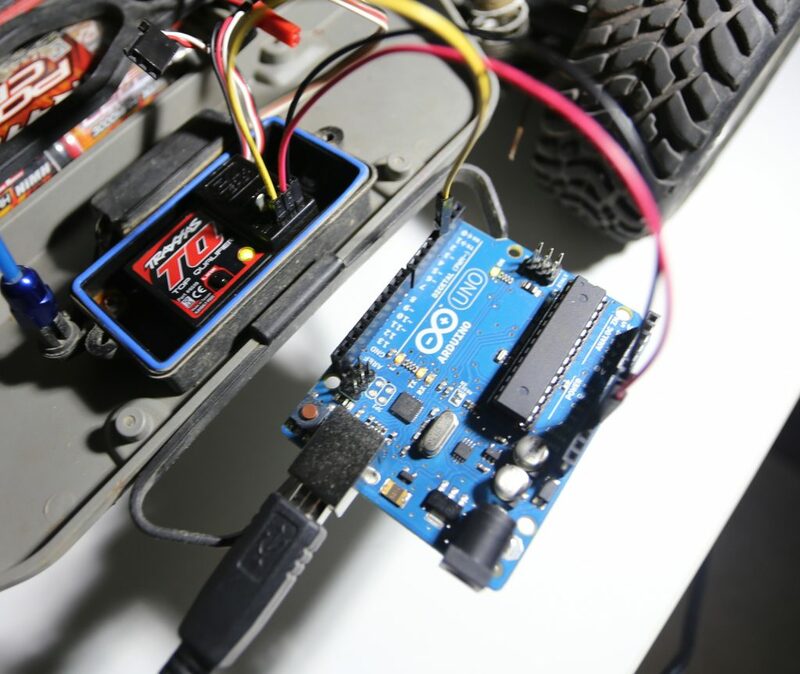 RC car radio receivers communicate with the steering servo and electronic speed controller using electrical pulses called PWM(pulse width modulation). 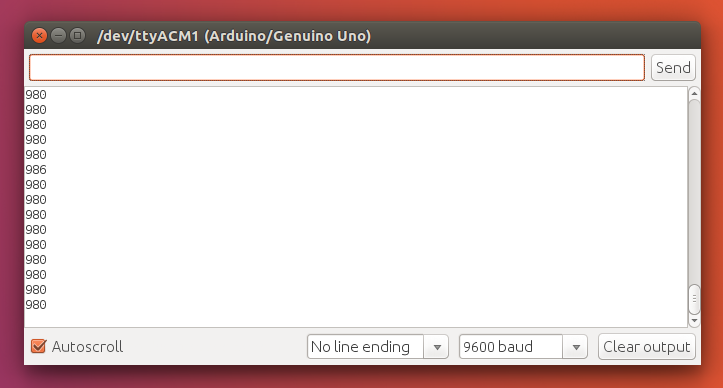 Using an Arduino, we are able to capture these pulses and print their values out to the Serial Monitor. 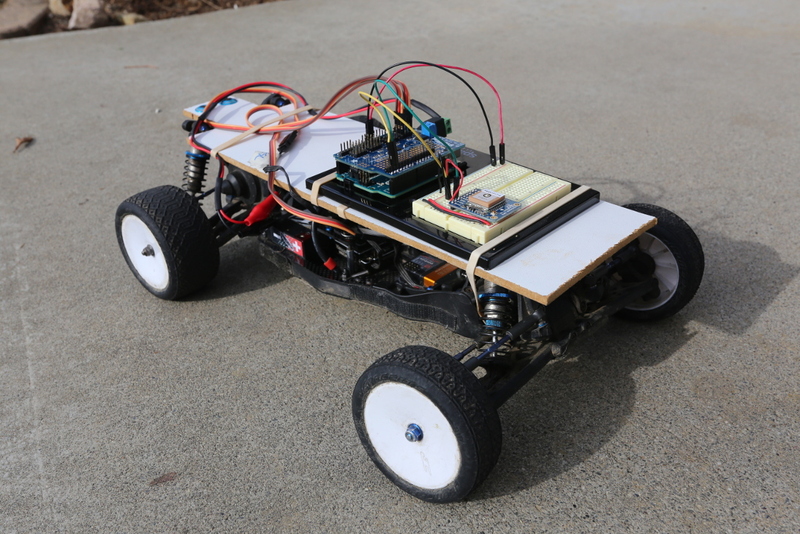 These numbers represent the width of the electrical pulse in microseconds, and are essentially the same numbers you would use in an Arduino sketch to control the car programmatically. 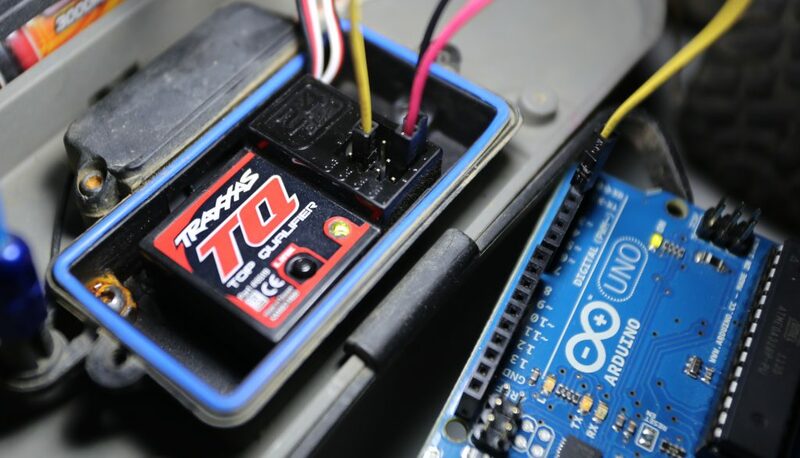 The TQ Receiver that comes with a stock Traxxas vehicle consists of two channels, representing steering and throttle. Starting from the bottom is Channel 1. The next one up is also Channel 1 (I am unsure why they exist in duplicate) The third one up is Channel 2 and it is used for the ESC. These are the two we are concerned with. The left-most pin is for the “signal”. This is the pin that communicates by sending electrical pulses to the servo and ESC, directing them to turn, go forward, or reverse. The middle pin is the Positive terminal. The right-most pin is the Ground/Negative terminal of your power supply. Note: the Positive and Negative pins are all connected together underneath. Sending power to any channel will supply electrical charge to any of the other +/- pins. Once you connect power to one channel, connecting power to the other channels is not necessary. Important: be sure to disconnect all wires from the radio before connecting anything to the Arduino. In the stock configuration, the receiver is powered by the ESC at 6 volts. You do not want to accidentally turn on the ESC with any of the radio’s +/- pins connected to the 5v pins of the Arduino as this may damage your board. To set up, you will need to plug a wire to a PWM pin on the Arduino. These are designated by the tilde ~ symbol. This code example will be using Pin 3. Connect Pin 3 to the left-most pin of Channel 1 on the receiver. Then connect a red wire from the +5 pin of the Arduino to the middle pin of Channel 1. Finally, connect a black wire to right-most pin of Channel 1 and the ground pin of the Arduino. Connect the USB cable. The LED light on the Receiver should turn red. This indicates that it is on but not connected to the Transmitter. Power on your Transmitter controller, the LED light should change green. Go to Tools -> Ports and select the port listed in the error code(in this example it would be /dev/ttyACM0). You should see values in the Serial Monitor. Turn the steering knob of the transmitter and the values should change. And neutral position should be around 1500. For reading the throttle values, simply disconnect the left-most wire(signal) from Channel 1 and plug it in to Channel 2. Look closely at the markings(it’s tiny!). Channel 2 is actually third from the bottom. Use a magnifying glass to be sure. You do not need to move the +/- wires since those pins are already connected together inside the radio. Now squeeze the throttle on the transmitter and observe the values in the Serial Monitor.